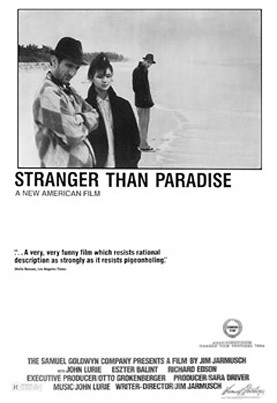 If you thought that Broken Flowers was full of scenes where nothing really happened, then you should check out Jim Jarmusch’s debut feature Stranger Than Paradise. Hardly anything at all takes place, and yet it’s so gorgeous to look at, it doesn’t really matter. Shot in black and white with a predominantly static camera, the film is reminiscent of early Goddard works like Vivre Sa Vie, with various vignettes fading to black then back up again to reveal the characters carrying on with their mundane lives a little further on down the track. Divided into three sections, the story takes us from New York to Cleveland to Florida on a journey with its three main characters. Eva (Eszter Balint) arrives in the Big Apple from Budapest with not much more than an old tape recorder which has, on high rotation, the mesmeric song, ‘I Put A Spell On You’ by her “main man”, Screamin’ Jay Hawkins. Through her eyes, New York looks pretty much like Eastern Europe with deserted streets full of concrete and cyclone fencing. And her cousin Willie (John Lurie) does nothing to prove otherwise. Stuck in a bored rut, he reluctantly accommodates Eva for a few days and together they chain smoke Chesterfields until the time comes for her to go and stay with her Aunt Lotte in Cleveland. A year later, Willie and his best friend Eddie (Richard Edson) head off to visit her with their poker winnings tucked into the pockets of their trademark retro ’50s outfits. Things look pretty bleak as they drive through the snow-covered industrial landscape but improve marginally when Lotte greets them with a comforting bowl of goulash. 95-year old Cicillia Stark is a hoot as the grumpy aunty, giving a thoroughly authentic, almost improvised performance. But the young trio leave her behind to explore what turn out to be even more monotonous pastures in Florida. Jarmusch won the Camera D’Or for Best First Feature at Cannes with this languid yet supremely stylish film. It’s a work that sets the pace for his future outings which, like Broken Flowers, often seem to revel in the power of awkward silences.